failed and we slid back down the tracks! 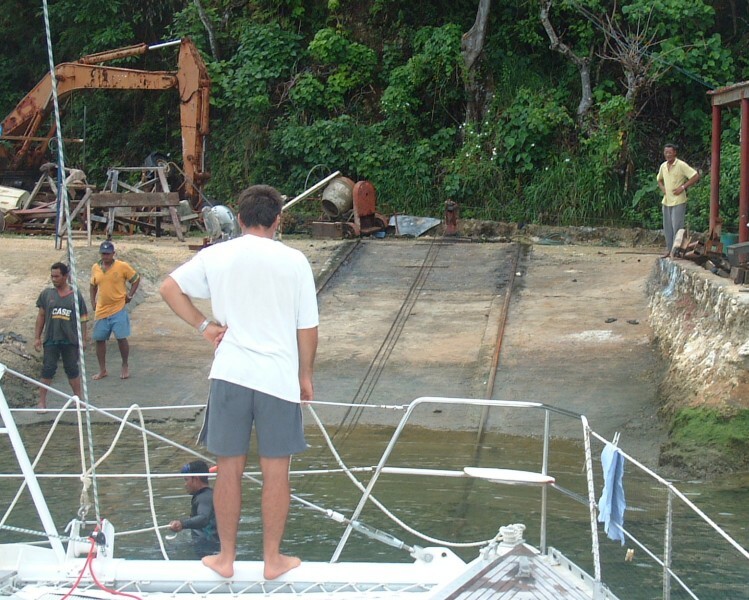 When we went to the Ha'apai Group in July, we had a ... problem. 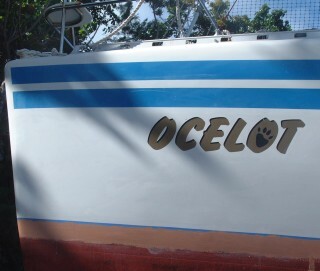 We were towing our watermaker pre-filters in the water behind Ocelot in order to clean them, and we forgot to pull them in when we set the anchor with the engines. The rope got caught in the starboard propeller, doing significant damage. All we heard was an almighty bang from the engine as the rope parted, followed by the ominous sound of the engine-room bilge-pump. Jon jumped into the engine room and immediately found a large pool of oily water, rising rapidly despite the bilge-pump. Feeling around in the water he found that the main seal between the saildrive and the hull was leaking badly. Luckily, there is a secondary seal as well, and that had just popped lose. Since he couldn't see into the oily water, he felt around until he found the hose-clamp, opened it a bit, pushed the seal back over its lip, seated the hose-clamp firmly over the seal, and tightened it gently. The water stopped rising and the bilge-pump eventually pumped it out, but not before it had risen half way up the alternators. Jon mostly worked on the engines & saildrives. Further examination revealed that the rope had ripped the entire engine and saildrive right off its mounts. All 3 engine-mounts were completely shredded and the engine was no longer sitting square. We sent several emails to the Yanmar representative in New Zealand to request parts, but we eventually had to call him on the satellite phone before they replied. It took them a month (and about US$1,000) before they sent us 2 of the engine mounts and 2 new water-seals. The 3rd engine mount and zincs we were able to find locally. So now we've been up "on the hard" for the last 8 days, trying to get work done on Ocelot. We usually haul every year, but it's actually been almost 2 years since we last hauled. 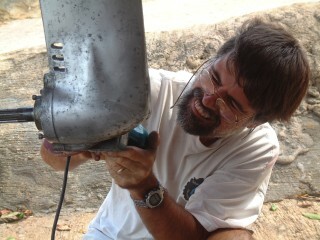 The antifouling paint was actually still fine, but we had to replace the broken saildrive seals and engine mounts ASAP. They have 2 marine railways here, and 1 of them is wide enough for us. They first tried to get us out Aug 30 - after working for an hour in dead-flat water, they couldn't get us lined up squarely on the car before the 1m tide ran out too far. The next few days had side winds, and I didn't even want them to try. Then we had an ... adventurous hauling on Mon, Sept 6. After faffing around for an hour, with Amanda and another teen playing tugboats for us in dinghies (I could only use our port engine) they finally hauled us up. We got to the top and I was about to jump down when we started rolling backwards! A pin had worked out of their winch, and we just rolled back towards the water, gathering speed with every heart-stopping second. I just about died! We hit the water with a considerable splash, but nothing appears broken. No apologies - they gave the offending pin a whack with a handy rock, and spent another 30 min lining us up and hauling us out. Again. YEESH! 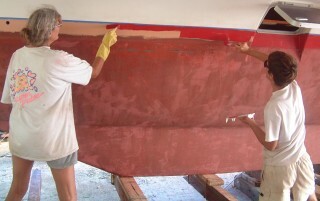 Sue and the kids prepped the hull with a borrowed power sprayer and sanding blocks. Our waterline has been growing scudge so we decided to raise it by about 3". Amanda laid out the new lines and found out that we're not symmetric, so she tried to even us out a bit, raising the port side a bit more than starboard. The ($100) epoxy primer we'd ordered from Nuku'alofa hadn't arrived in time, so we took the opportunity to sand, acid-wash, wax and buff much of the topsides (the hulls, if you will). It looks nice and shiny now, but it also shows up the dings, so we need to fix those. Hull polished and with a new waterline! We made a mistake the last time we hauled by painting the bottom of the dinghy, outboard, and our saildrives with a copper-based antifouling paint - and all of those surfaces are aluminum. 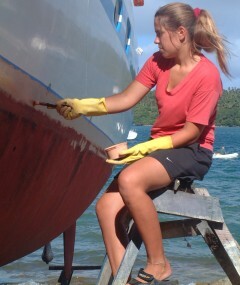 This may be why the paint has been peeling off the dinghy. More importantly, we saw the catamaran "Hibiscus" in Panama (we'd actually sailed on her in Florida when we were looking at boats) that had both of their saildrives rot-out on them from copper paint reacting with the aluminum - they had to throw them away! So we hired some guys here in the yard (US$10/day) to remove all the old paint from all 3 areas. Then we painted them with a good 2-part aluminum primer and special antifouling paint for aluminum. Our helpers also repaired the outboard's frozen tilt-up hinge, broken hood-latch, and broken water-spout (YAY! 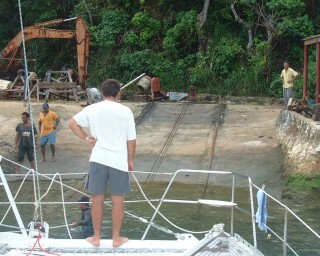 ), as well as helping with the topside work, and fixing the alternator that had overdosed on seawater. Jon was down in the engine room most of the time replacing the broken seals between the saildrive and the hull. This involved splitting the foot of the saildrive in half by reaching up into the "well" from the bottom, and hoisting the back of the engine/saildrive up with a rope from above. When replacing the front engine mounts we found that the left one had a different bolt spacing, requiring some persuasion with files, hacksaw, and Dremmel to make it fit. We expected the same problem on the right side, but no - it just dropped in. Jon and a friend also replaced the seals around the drive-shafts on both saildrives - an unbelievably complicated process for a routine maintenance item - it even requires a special $200 tool. All of this was complicated by the rain (we lost 2 whole days), Sunday (not allowed to work), having to sleep at an angle (the railway isn't level) and the dirt, grit, and mosquitoes that seem endemic to boatyards. We didn't get to start painting until Saturday, which was MUCH later than we'd hoped. On the good side, we had unlimited (cold) water for showers, and we splurged on meals out with friends at the "yachty bars" several nights. 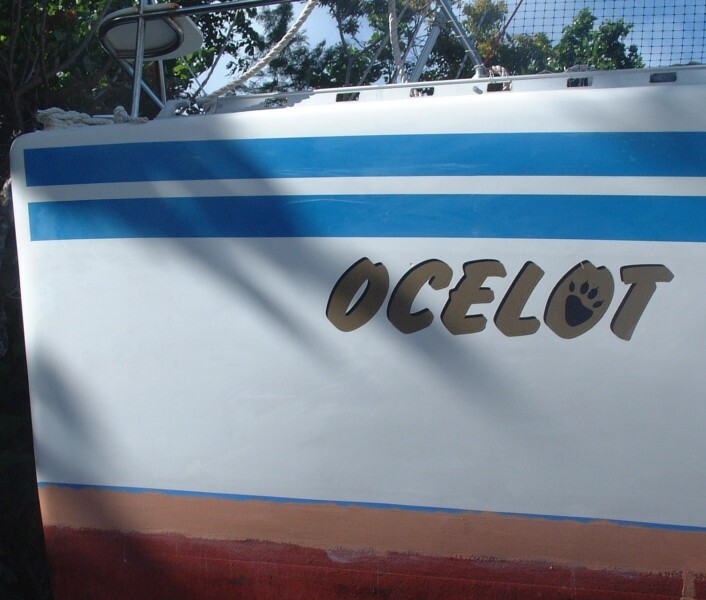 We finally got back into the water Tuesday morning, and Ocelot looks great (in our unbiased opinion). As soon as we can get our headsail roller-gear swivel back from being repaired in NZ, we'll be ready to go sailing again!